If you refuse to look at another farm game because it either resembles Farmville or couldn’t match Farmville, you’ll miss out on a fun farm remix about saving the chicken population. AppMania‘s new Farm It! Seasons is unlike any Old McDonald tune you’ve ever sung and it’s worth checking out. 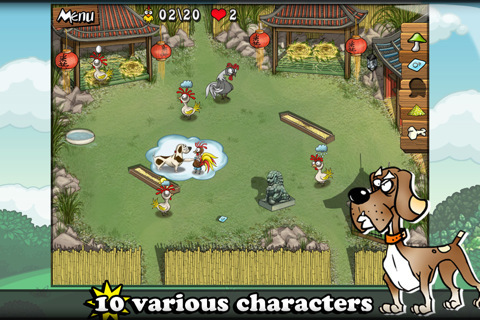 As the heroic head rooster on the farm you’re obliged to solve the chick population problem by giving the hens a little action. To do this you have to tap near the hens and watch as they partake in a short and clever animation session of jump rope or something like it. Being the man of many hens doesn’t come without its trials though, and keeping the hens laying and happy isn’t any old walk in the park. There’s an elderly brown rooster at your heels and ready to give you a beating unless you place feed in front of him on time. There’s also a dog happy to ruffle your feathers if you try anything while he’s awake. Apparently the farm is full of enemies ready to stick their nose in your business. 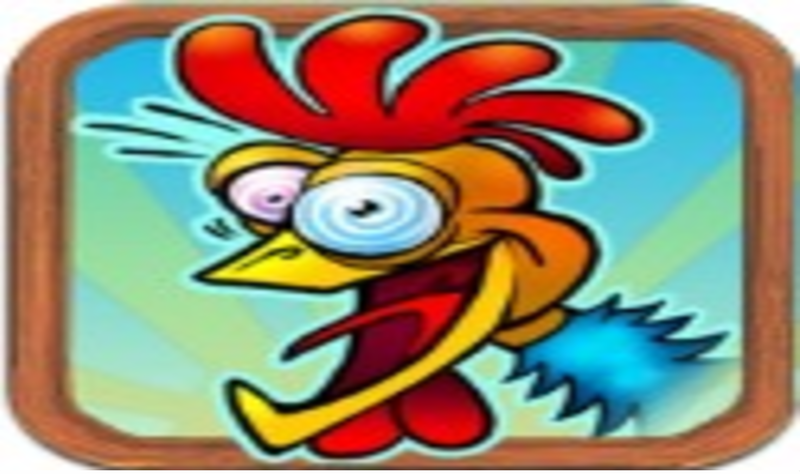 To gain victory over these nosy troublemakers you have to tap your rooster to different parts of the farm strategically, picking up bonuses and dropping them in front of enemies just as they approach. Avoid all the wrong things while giving the hens all the right things at just the right time. The resulting game is a kind of modern day Pac Man where the half circled bad guys take the shape of farm animals and the standard grid of yesteryear is nonexistent. Every level requires a certain lift in population so you have to figure out how to get it on with enough hens without losing all your lives to farm animal scuffles or it’s time to start back from the beginning. Farm It! 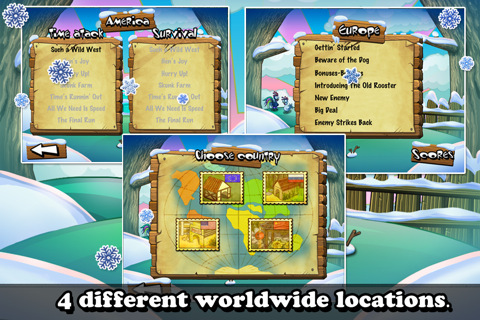 Seasons boasts four countries in all, each with multiple levels and variations of the six different meddling farm animals. 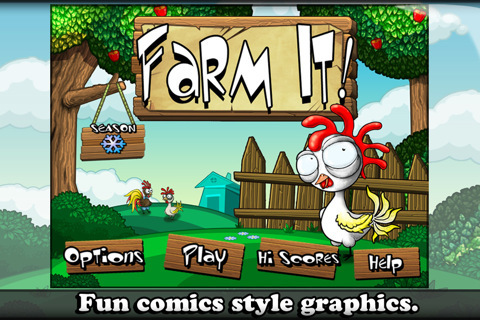 The graphics are good, the soundtrack is fun, and Appmania seems to have done well with all the little farm nuances. Spend too long away from the chickens for example, and the protagonist starts to daydream about their blinking eyelashes and envisions jump roping sessions he misses in his abstinence. 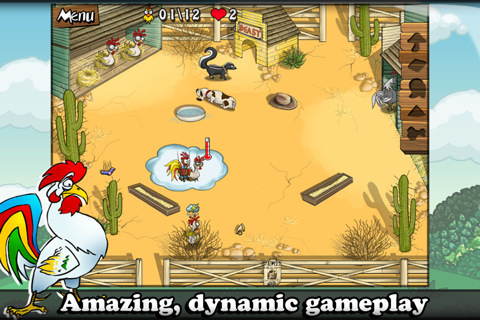 The 27 achievements along the journey to chicken population renewal add some compelling elements of addition, but when it comes to playing, this is a game best suited for those in between times when you have a few minutes to spare saving the chicken population. Bottom Line: Farm It! 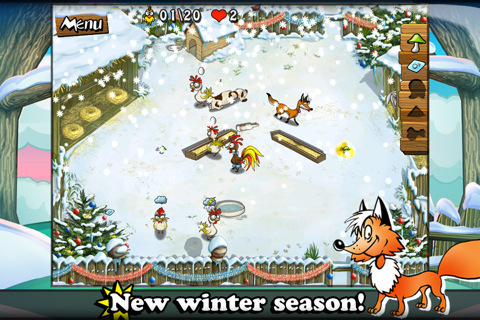 Seasons is a clever game of animated reproduction euphemisms. This is a farm game may not have the most substance out there, but it’s certainly full of fun.